1. 5-pound tuna fish canned, drained, flaked. 4. 1/3 cup onions, minced. 9. 25 slices or wedges of lemon. 1. Place the tuna fish and celery in a mixing container. Toss gently. 2. Add the onions, juice of 2 lemons and mayonnaise. Toss gently a second time. 5. Place a mound of the salad in the center of each plate. Top with a small amount of additional mayonnaise. Tuna fish salad can also be served as an entree or main course salad by increasing the serving portion and serving it in a large salad bowl. The garnish generally consists of hard boiled egg slices and slices or wedges of tomato. 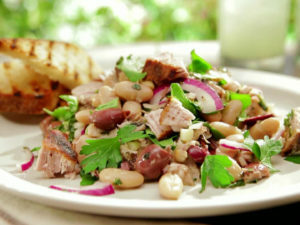 Tuna fish salad is sometimes prepared by adding sweet relish or chopped hard boiled eggs to the ingredients. Always serve a slice or wedge of lemon with seafood salads.